Have you ever thought you might be dreaming even though you were awake? Maybe you’ve had dreams that seemed so real, you only thought you were awake. What if your dreams are more similar to waking life than you ever imagined? Beyond that… what if they are more real? Robert Moss wrote Dreamways of the Iroquois for several reasons I am sure. However it seems the most important and valuable message in this book is to “reclaim the dreamways and their paths to healing and soul remembering”, thus is the way of the Iroquois. Dreams have healing properties. This is likely true be it emotional, spiritual, physical or all of the above. Robert gives examples of people with emotional scars. One woman felt her father was not there for her when she needed him most. It came back to her in her dreams. By confronting the dream she found that she could forgive her father and in that forgiveness she released her own emotional scar. I imagine she felt a lot better. 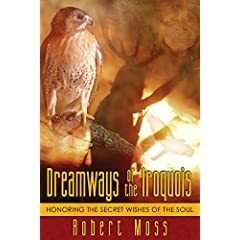 “The Iroquois teaching is that if we have lost our dreams, we have lost part of our soul, the part of us that is the dreamer.” An example of possible soul loss is revealed through Robert Moss himself. Robert has written bestseller cold war novels. He was obviously getting paid for his bestseller but he was not happy. In fact, he was depressed. His soul needed to help and heal people. Now he writes books about dreaming and healing that would help anyone through life who felt like listening. He is much happier now. In contrast, Robert notes a story by Charles de Lint, a soul-loss writer. Entitled, The Words that Remain, a writer enters a hotel and meets a young woman with spiked punk hair named Mary. She goes on to tell him that the hotel is haunted by a girl that made a deal with death to kill her bright soul so she could take over management of the hotel from her father instead of pursuing her dreams of being an artist. When checking out he tries to bring a copy of his book of soul loss to the girl and is snapped at by a much older woman claiming to be the only Mary that works at the hotel. He realizes that this woman was once that young artistic girl. Through many lifetimes you may and probably will acquire several souls and several more experiences with each of those souls. If you were once a marine, you might have a less than hidden desire to run out and join the military every once in a while. If you really aren’t the military type then this is an old soul trying to get you to appease it. This could be harmful to you in ways you don’t feel like being harmed. Using dreams to recall past lives or present souls you may be able to understand better your desires and put them to a more practical use for you as a person. In this case, you could appease that particular soul by establishing greater discipline or maybe… just go play some paint ball. Lastly, dreams can hint at the future events. If the dream hints that you might have cancer or another ailment that might not show through right away, you have a perfect advantage in taking care of the problem before it develops into a more serious one. With a little bit of trust, Robert has dreamed people to medical answers that would have otherwise not even been questioned in the first place. Between healing and soul remembering, Robert goes into great detail about his personal dreams and their relationship to his or others’ waking lives. He mentions spirit guides and animal guides that also have helped him. Most dreams are mentioned in the books to help him to create a pre-dream preparation for you as a reader to experience and appreciate the wealth available to you in your dreams; though some dreams may have been mentioned just because they were really cool. Be prepared to experience several lifetimes of dreams and their effect on people. Dreamways of the Iroquois, by Robert Moss will take you on an expedition to reclaim the dreamworld. I hope everyone enjoys it as much as I did. Robert Moss leads innovative programs all over the world and is actively engaged in research projects that include the applications of conscious dreaming techniques to healing and care for the dying; creative innovation and conflict resolutions; dream education in schools; and future science. His many publications include Conscious Dreaming: A Spiritual Path for Everyday Life (Crown), Dreamgates: An Explorer's Guide to the Worlds of Soul, Imagination and Life Beyond Death(Three Rivers Press), Dreaming True, the novels The Firekeeper and The Interpreter, and the popular audio series Dream Gates: A Journey into Active Dreaming (Sounds True).